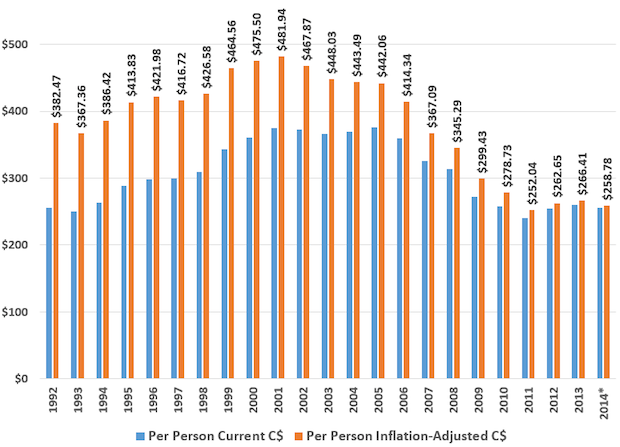 Using printing shipments and population data from Statistics Canada, we have prepared this chart that shows per capita shipments of commercial printing in Canada current dollars and Canada inflation-adjusted dollars. In the USA, this statistic peaked in 1995, but it did not peak in Canada until six years later. The USA trend for this statistic is a decline, but Canada's has flattened. Though the USA and Canada economies are closely linked, there are cultural, social, economic, and regulatory factors that affect the timing and extent of media change. Together with the relative smaller size of the Canada, change patterns can be quite different and can often be jagged. Assuming Canada is a steady percentage of the US market is okay in general discussions when precision is not important, but should not be counted on in important decisions.